Fee schedules for the 2019-2020 academic year. The above fee is applicable to the residents of African countries and subject to an annual review. A one-time Non-Refundable Admission Fee is payable for students enrolling for the first time. The admission fee must be paid to secure the place for a child in the Academy. This cannot be deferred or paid in instalments. The due date is one week after the offer has been accepted. A one-time Refundable Security Deposit is also payable on acceptance of admission and should be paid together with the admission fee mentioned above. It is refundable when a student leaves the school as long as the required notice has been given in writing and “No Dues” clearance is obtained from the Academy. No interest is payable on this deposit. The residential students will pay the premium for medical insurance separately as indicated in the fees table above. This will be arranged by the Academy and the premium will be due along with the first tuition fee instalment. The residential students will also pay KES 20,000 against the stipend that will be managed by the Academy. The students will be paid KES 500 per week to cover any personal expenses. The following Residential Programme fees are applicable to international students and payable in USD: Grades 6 and 7: USD 27,300; Grades 8 to 10: USD 30,420; and DP Program: USD 38,100. All other charges are applicable as per the table above. The rates for lunch indicated above are applicable only if paid in advance for the whole year or at least for the whole term (1/3 of total cost). 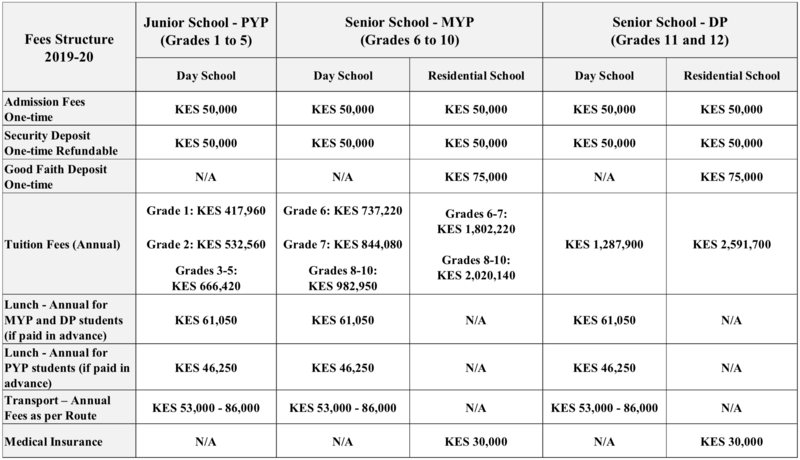 For daily lunch payments the Academy will charge KES 380 to MYP and DP students and KES 330 to PYP students. A Sibling Discount of 5% is applicable on Tuition Fees for the second child and subsequent children. Tuition fee is payable in three equal instalments, no later than 15 July, 21 November, and 1 March for each academic year. Tuition fees may be paid in full for the whole year with an early-payment discount of 3%, if paid before 15 July. This discount is applicable on the net amount payable after other discounts have been deducted. The fees can be paid in US dollars or Kenyan Shillings. The US Dollars fees will be indicated on the invoice using the Central Bank of Kenya’s exchange rate on the invoice date. The Academy however reserves the right to change this policy. The Academy will charge a monthly sur-charge of 3% on the total outstanding dues older than 30 days and in case the fees are not paid within one month’s period following the deadline, the student will not be allowed to attend classes as well as participate in the other activities undertaken by the Academy. Tuition fee includes course fee, use of essential course books, library books, IT and science laboratory equipment and certain classroom supplies. This however does not include uniform. Starting from Grade 4, students may also take up to three field trips including curriculum, bonding and optional trips, for which the parents will be invoiced separately. Information on these field trips will be shared with parents at least one month in advance. Exam fees for MYP and Diploma will be billed separately based on actual fee from International Baccalaureate Organization (IBO). The MYP and DP students are expected to own a personal computer that meets minimum performance standards as most of the assignments as well as the communication between the teachers and the students are computer based. The system should be loaded with either iOS or Windows, MS office, Internet browser and Antivirus. The Academy does not accept cash for fee payments. All payments must be made by direct bank deposit, bank transfer, or Mpesa even if payment is made by a third party such as a sponsoring organization. Parents must provide the finance office (MBA-BURSAR@agakhanacademies.org), with a hard or an electronic copy of the proof of payment showing the full name of student and Student Identification Number within 15 days of fund transfer for issuance of payment receipt. Absence of this information may delay crediting the fees reflected on your account in our system. Parents are responsible for ensuring that the fees payments are made into the correct bank account of the Academy. In the unlikely event of any change in bank account, the changes will be communicated to parents in writing via a hand delivered letter from the Academy. If a student wishes to leave the Academy, one term’s advance notice of withdrawal must be given in writing or one term of the annual fees will be due and payable. School clearance will not be possible until any outstanding dues are settled in full. The Academy reserves the right to withhold results, school certificate, transcripts or any other information and/or document until all outstanding dues are settled in full. The admitted students, who demonstrate financial needs and duly fill in and submit the application with the required supporting documents with stipulated time, can be considered for Financial Aid. An independent Financial Aid Committee is responsible for reviewing and approving any request for Financial Aid by the students.